It's been a little hectic around here lately with 2 sick cats, and today, a broken water heater, but I have managed to make some progress. I can never seem to get a good picture of this one. It seems too flooded with light. The colors are a bit bolder than they appear. Hopefully I can finish this up soon, although I know the bottom border will take a while! I am not sure how I will finish this one, whether I willl use a mat or not to frame it. I am already thinking about the next project. There is an autumnal design I would like to do. Somehow I can never manage to time seasonal things right! I do need to make some Christmas ornaments. Perhaps I can sneak a little one in before going on to the next project. And. . . oh yes! There is always the rug that is calling me to finish it! Gosh Erica, if you didnt have much time your needles must have been on fire. I was amazed whn I saw how much you have done. You only had the saints names at the top last time. Oh I know exactly what you mean when you say you are planning the next one lol. Hi Erica, thanks for visiting my blog and leaving a comment. Your House Blessing is progressing at a rate of knots it would seem. 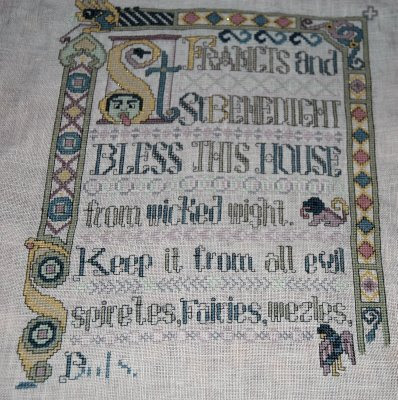 I had a look back through your blog and you said not so long ago that it wasn't going to be a quick stitch! It would have taken me months (or more) to get as far as you have. It looks wonderful. You really have made *alot* of progress, looks great! Thanks for visiting my blog. Your needlework is fabulous. Great blog! You are making good progress and the stitching looks great. Stitching seems to help relieve the stresses of the day. Anxious to see what you choose for your next project. In my opinion, I probably would not mat your piece. It has it's own well-defined border. Don't want to detract from that. Hi Erica, Just to say thanks for the tip on the OTT light, I will get a spare bulb to keep in now lol. I had a lovely lamp with light, clip to hold your stitching frame and magnifyer. Unfortunately the lamp went and could not be repaired but rather than replace the lot my hubby managed to remove the light part of it so i still have the "pole" for want of a better word, with the magnifyer and frame clip. The new OTT light I am hoping will clip onto the pole and replace the missing light.